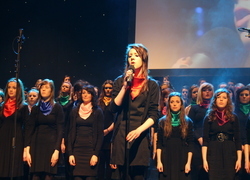 The last live concert by Kerry’s Christian youth music group Teen SpiriT took place in the INEC Killarney on Tuesday the 6th of March. As musical director Noel O’Sullivan promised beforehand they really “threw the kitchen sink at it”! There were two performances on the day – one for schools at 11.30am and an evening one at 8pm. For audience members who had seen them before they were once again thrilled by some excellent entertainment. For those who were experiencing it all for the first time they were really amazed by the quality, the vibrancy, the sheer talent and professionalism. Teen SpiriT is a unique phenomenon, combining as it does youthful pop performances with a deep Christian message at the heart. It is this Christian core that gives Teen SpiriT its strong impact. It was beautiful.